That you have scores and scores of queries out for all those manuscripts you’ve squirreled away for the last decade. Which brings us to the problem of having an embarrassment of riches–keeping track of that embarrassment of riches. …ahem…consisted of a messy notebook with cross-outs and arrows and barely legible thingamajobs. DO NOT DO THIS. I highly urge the online spreadsheet. You don’t have to be an Excel master to work one. Lord knows I am not. 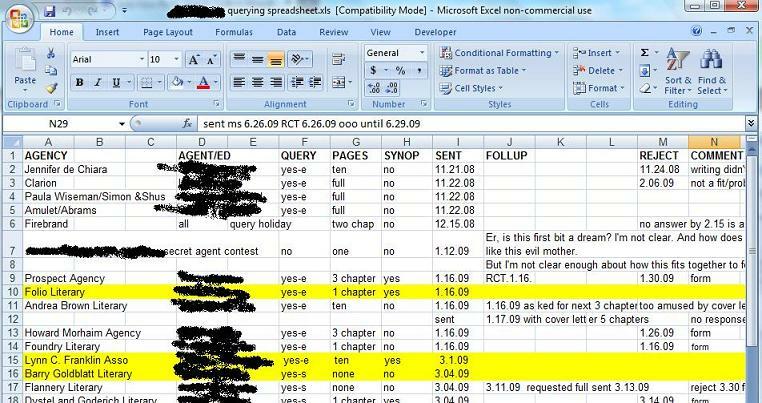 You won’t be showing it to the class–the query spreadsheet is for your eyes only. So put anything you want to keep track of at a glance right on it. There are the usual headings: where, when, how long, and have I heard back. Also, the method by which this little gem was sent. Besides email and snail mail, many magazines are using submission managers like SubGenie. In that case, you will receive a password to check the status of your manuscript, so leave plenty of room in the spreadsheet. On this example, you can see in the comments section that ICL Online was generous enough to tell me why my article didn’t fit its readers’ needs. Important, because when I want to submit to ICL again, I have that targeting tidbit right there on a spreadsheet, instead of buried in emails or in a box under my bed. Or maybe it’s in the closet. Could it be on that shelf over the dryer? When I sold this puppy, I highlighted the lucky buyer in red and filled in the grand amount. Always have a column for the agency and the agent. If you revise and query again two years later, you will want to know who you queried in an agency. Also, agents move. Sometimes a submission is through a one-on-one pitch or a contest. That’s why you see a column for “query” with “yes-e” for email or “yes-s” for snail mail, and even a “no” for a contest. Keep track of what the submission requirements were–pages, chapters, synopsis. Because sister, (or brother), you are NOT going to want to reformat that stuff into the body of an email over and over. Copy paste is your friend. AND ALSO YOUR ENEMY. CHECK TO MAKE SURE YOU PERSONALIZE EACH SUBMISSION CORRECTLY. Date sent column, obv. In the Follup column, “RCT 1.16” means I received a notice from the agent that she received my query. This is also where I noted status queries or requests for fulls. OH I GOT A FEW YOU AREN’T SEEING THE WHOLE SPREADSHEET. Look in the Reject column by Firebrand. It says “if no answer by 2.15 is a no” I put the average waiting time in this column. When the reject comes, I delete that and put the rejection date. If there’s a comment, which is GOLD, I put that in, if not, I write “form”. I highlight the queries that are still out in yellow. Once there’s an answer, I unhighlight. Red highlight means SOLD. When you keep your comments on one spreadsheet, patterns show up more clearly. Are most of your rejections pointing to a soft or unsatisfying ending? Well, you know where to revise. Are the reasons all over the map? Then it’s a matter of taste. Keep going. This is how I keep track of submissions. 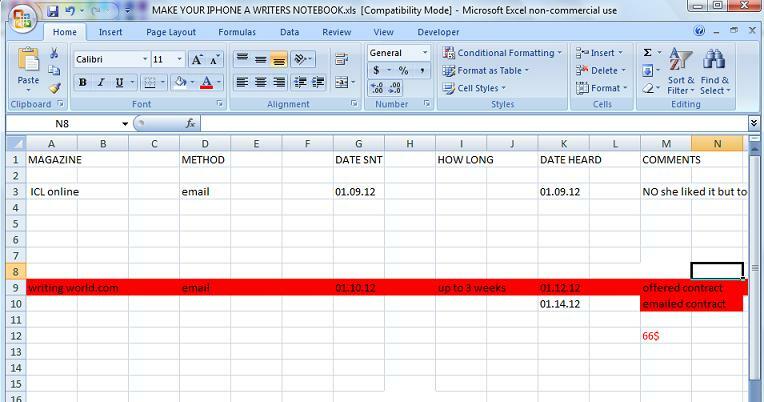 Sit down with Excel and figure out how it will best serve your querying needs. Then nothing will be s’motta with you. Very educational…I will strive to follow your STELLAR example. Thanx, Cathy. And I LOVE A WOMAN WHO RESPONDS TO A TWITTER CALL. And I promise YOU that you will thank yourself for figuring out a spreadsheet system that fits your needs. Srsly. Thanks that is a very helpful post ! Thanks for linking, as it shows how everybody can set up exactly the info they want to track. Very nice.